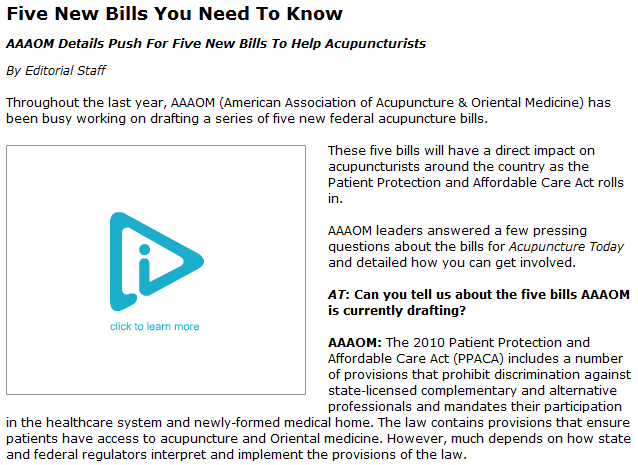 As PPACA goes on full swing, the AAAOM is crafting five new bills to address three important issues facing the profession. 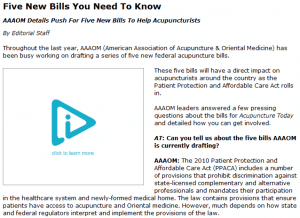 These important issues are the authorization of working in federal healthcare programs and conventional medical facilities, eligibility for reimbursement through federal and relevant state programs, and reinforcement of non-discrimination towards acupuncturists. The draft bills provide direction on how to properly address these issues. The AAAOM says that in order to push these bills forward, they first must form a degree of consensus among its members. By establishing a general consensus, it ensures that many of their members comprehend and agree on the content of the bills. Additionally, AAAOM is working with congressional leaders and their staff to help them understand the issues involved and get their support for the initiatives of the association and its members. AAAOM adds that because of the joint efforts of other national and state association partners, almost 54 million Americans in six states got involved since last year. This movement can also benefit a clinic like East West Healing Solutions, or just about any acupuncturist in Palm Harbor and the rest of Florida. The next 17 months represent an important moment not just for AAAOM and its members, but for all practitioners and their patients who wish to voice their collective needs to Congress.